kidsdiscover.com/kids-discover-online/■Retail Price: Individual educator: $12 a month. Contact vendor for school and district pricing. Kids Discover Online offers over 100+ units of ad-free nonfiction science and social studies articles for elementary-and middle-school students. The articles, most of which include infographics, interactive elements, and images, cover over 1,000 topics. Educators can create classrooms and choose one of three Lexile reading levels for each student. An educator subscription comes with one classroom and accounts for 34 students. Each additional classroom costs $4/month per additional classroom (educator plans are billed annually). School-and district-level subscriptions are also available. A free individual account offers 30 different units and 200 topics, which change on a weekly basis. The free version does not enable educators to switch Lexile levels or create classrooms. Quality and Effectiveness: Kids Discover Online delivers science and social studies articles and units on topics ranging from world history to the human body. The articles are well written and engaging and many contain interactive elements and high-quality images that add interest for students. Because the articles can be delivered at three different Lexile levels, the materials are accessible for all students in a class. Experts in the field vet all articles, and the images and interactives are accurate and appropriately portray the subject matter. Ease of Use: Kids Discover Online is very easy for both teachers and students to use. When teachers assign articles, they’re delivered to students at the appropriate reading level. Students are also able to browse for articles and choose a reading level (easy, medium, or hard). Kids Discover Online offers a concept-map-style graphic interface called Discovery Map, which allows students to see connections between topics when they’re browsing on their own. Students and teachers can also search for articles using a traditional list organization. In addition, teachers can search by state, grade level, and subject to find units that align to standards they’re addressing. Although Kids Discover Online offers a variety of helpful tips and tutorials, the product is simple enough to navigate and use without them. 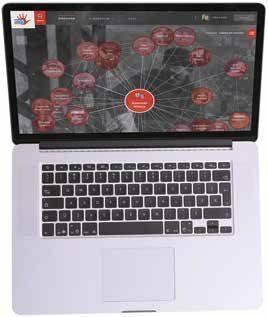 Creative Use of Technology: One of the most powerful features of Kids Discover Online is the Discovery Map, which shows the interconnections between topics so that students can see connections between content and subject areas. The map also makes it easy for students to learn how to focus their inquiry, starting with a broad topic and narrowing down to specific articles. Kids Discover Online contains articles and materials that have been produced by Kids Discover Magazine and can be used on any device via the Web. The images and interactive features that accompany the articles are of superior quality. The coming search features for teachers will make it easier for them to find alignment between Kids Discover materials and the standards. Suitability for Use in a School Environment: With Common Core State Standards calling for reading across the curriculum, Kids Discover Online offers a fantastic resource for nonfiction texts in science and social studies. Because the articles cover such a wide variety of topics, it’s easy to begin using this resource with students right away—either as a full-class activity or as a jumping-off point for inquiry-based research. Highly engaging content and an easy-to-use interface make it easy to draw students into reading about history and science. Educators will find engaging articles to share with their students on the topics most commonly taught in elementary and middle school. Students can navigate their own paths of inquiry using Kids Discover Online to find new articles on topics that interest them. • Ease of navigation—students and teachers can easily find articles on over 1,000 topics. • Quality of content—the articles, including stunning images and interactive elements, will engage readers at all levels. • Discovery Map—this fantastic tool will help students find connections across content and curriculum topics.